Hello my friend, 311 Digital is a customized social media marketing service. We help musicians, bloggers, artists, sports athletes, and private people to increase their exposure on Instagram, Twitter, Facebook, Spotify, blogs and more. With 311 Digital, you can grow your fan base organically without spending hours on marketing! Gain real fans, and increase your social awareness.Do you need to promote your music on Spotify? We are here to help you publicize your hot single or playlist FAST and EASY! 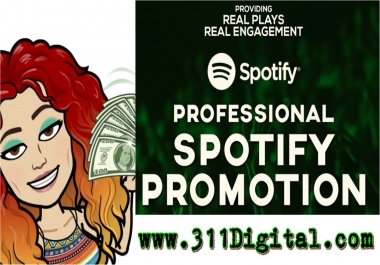 Your exclusive Spotify campaign will be advertised on our most popular social media sites. Why choose us? US based (American plays) Bots not used EVER (Organic) Real plays Real followers With this service you will get: 500 streams. NEW SPECIAL: You can create your own campaign with up to 50000 REAL plays. These plays come from REAL PEOPLE in the US. If you would like plays worldwide, please include that along with the song/album link.